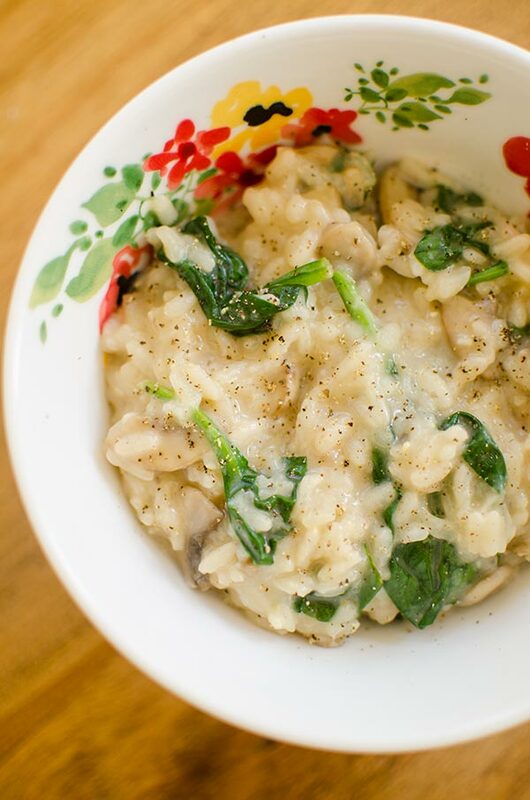 A delicious vegetarian recipe for a creamy spinach and mushroom risotto made with cremini mushrooms, arborio rice and baby spinach. Winter and fall are definitely my favourite seasons for cooking. I find myself so inspired by all the cozy comfort foods, braising, roasting, slow cooking and the like. I’ve been cooking up a storm the past couple of weeks and I know that you are going to love the recipes I have planned over the next couple of weeks. The one thing about the fall though, is I never really thrive during this transition from beautiful, sun-filled days of summer to darker, cooler days of fall. Do you ever find yourself in a funk? Something doesn’t feel right but you’re not sure what? Everyone has their own way of snapping out of a funk, maybe you’re more of the healthy and proactive kind of person? You snap out of it by focusing on wellness; getting more sleep, eating healthier and drinking more water, reenergizing with yoga or meditation or whatever it is that helps you recharge. Are you that person? Teach me your ways! I’m so guilty of doing so many things that probably get me deeper into funk than out of one. I do things like pack my social calendar, which leads to less sleep and groggier mornings, I fuel my body on caffeine (so much caffeine), I work a lot, maybe too much. 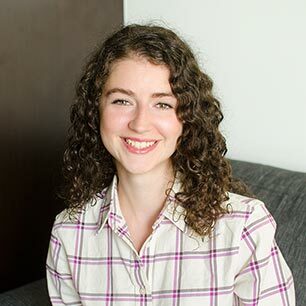 It’s kind of like I try to over-function, those overachieving gremlins creeping back in, to show myself ‘Hey, look how great this is!’ which works for a bit, but then eventually, I just end up exhausted and look to those healthier strategies I probably should’ve started out with in the first place. One of those strategies? Cooking, obviously. But not cooking for the blog, just cooking for the sake of cooking and creating, without any pressures or thoughts of this blog in the back of my mind. I started by making risotto because I love how meditative it is — the browning of the mushrooms and onions, the stirring, the slow addition of chicken (or vegetable) broth. Risotto is one of those dishes that seems like a labour-intensive process, but it’s not really! It all starts with olive oil and onions, the way most delicious recipes start. Can you think of a savoury, stove-top recipe that doesn’t start by sauteing onions? Neither can I, though I’m positive they do exist. The mushrooms get browned, developing deep flavour. Many mushroom risotto recipes call for dried mushrooms, which while delicious, also tend to be on the slightly more expensive side of the spectrum. I’ll stick to my button or cremini mushrooms for now. In the early days of Living Lou, I posted a recipe for spinach risotto and I thought it was about time for a new risotto recipe which is how I even started thinking about this spinach and mushroom risotto recipe. Heat a large saucepan over medium heat, add broth. In a large saute pan, add olive oil and onion. Cook 3-5 minutes, add garlic, cook another minute. Add mushrooms, cook for 5 minutes. Add arborio rice and salt, stir to coat and toast the rice. Add wine, cook until fully absorbed. Add warm broth 1/2 cup at a time, stirring until absorbed. Continue with broth for 20-22 minutes, or until rice is cooked and creamy. Add spinach, parmesan and butter. Serve immediately. 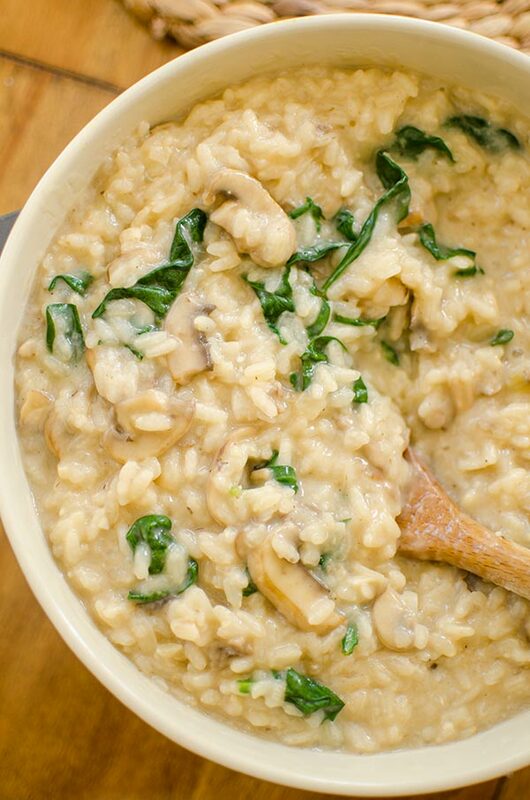 Let me know if you give this spinach and mushroom risotto a try. Thank for publishing the nice and tasty recipe. The ingredients of it are nutritious. Mushrooms and spinach are good for health. Spinach and mushrooms are both the rich source of calcium. Good to improve the bone health in kids. You can't call this a vegetarian dish when you use chicken broth. Hi there, you can also use vegetable broth here--it should say that in the recipe, but I see I forgot! Will update. :) Thanks! Lou, I made this recipe at 3am after a night out and it was EARTH SHATTRERING. Seriously, so delicious. Tell my loved ones I want to be buried in this risotto when I die. That is all. Haha! Love that Mckenna, so glad that you loved it! Thanks for letting me know.